I don't really have any specific memories/memorabilia re Friars, except that I always enjoyed playing there. 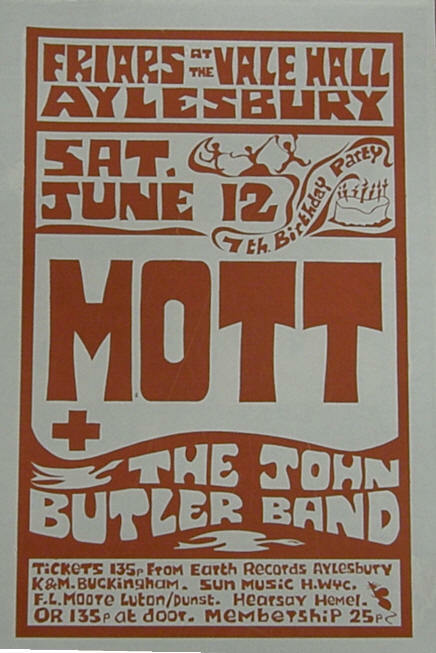 Of course next year (2009) is the 40th anniversary of the formation of Mott. That would be the time to reform for a world tour... No offers have come in yet - we need to get those 87,000 ex-Friars members clamouring for it! 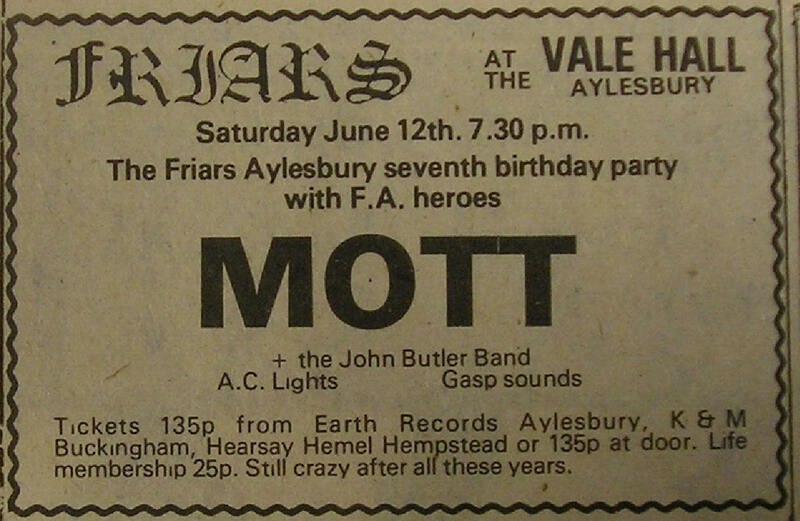 Mott the Hoople split in 1974, not before Hunter brought out the highly acclaimed 'Diary of a Rock and Roll Star' book. Ian Hunter still records and tours to this day (the webmaster saw him in 2007/2008 and he was on blistering form, with Terry Allen joining him on stage in 2007). 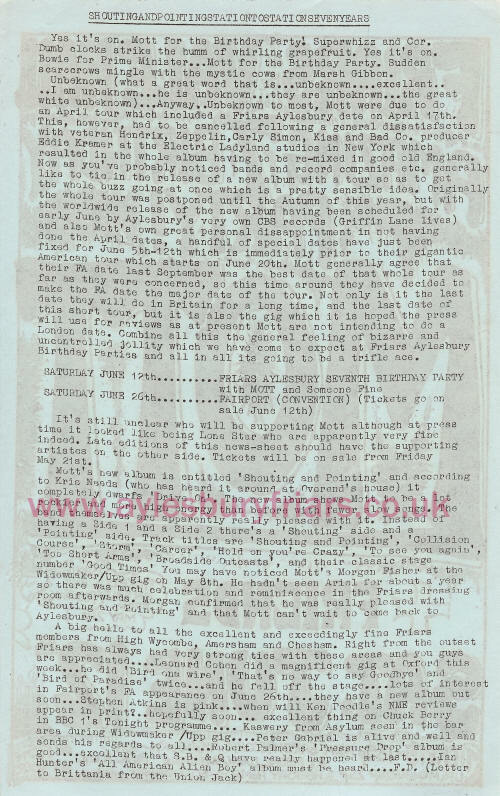 Hunter played Friars in 1975 as the Hunter Ronson Band with the late Mick Ronson and in 1977 as Ian Hunter's Overnight Angels. 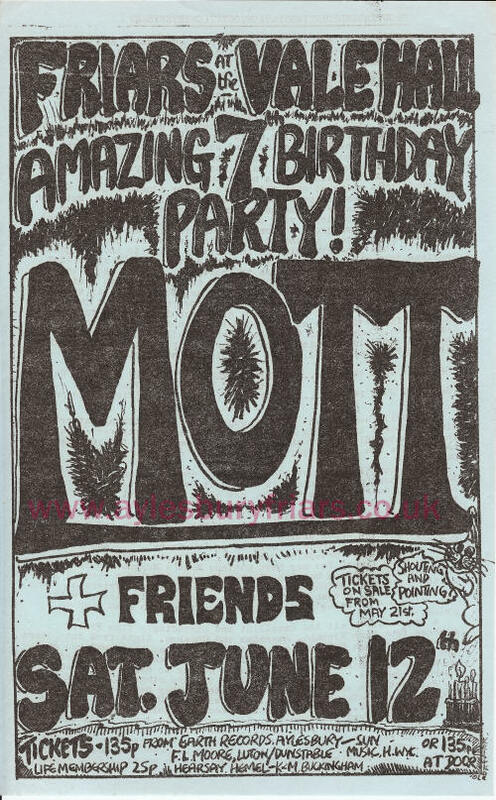 The remainder of Mott the Hoople carried on as Mott with a couple of line up changes (see date links above) Hunter also provided a guest appearance at the British Lions (remains of Mott with John Fiddler from Medicine Head) gig in Dec1977. Mick Ralphs, post MTH, joined Bad Company with Free's Paul Rodgers and Simon Kirke. Dale Griffin continued into the Mott and British Lions periods (both of whom played Friars) and then became a Radio 1 producer and is now in ill health. Verden Allen was still making music as at 2002 (and in fact 2007 as we saw him play with Hunter on his UK tour). As as for Overend, his history is not so well defined. Mott the Hoople with the original 1969 line up reformed for 40th anniversary shows in October 2009 at the Hammersmith Apollo. Some of the Friars team were there and can confirm it was a sublime experience.